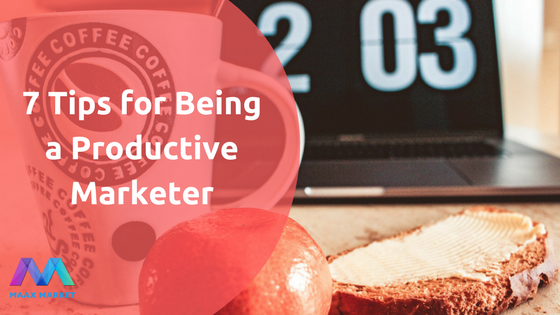 Marketers generally have busy schedules. And lots of different tasks to juggle at any one time. And a ton of deadlines to meet. It’s a tough but really satisfying gig when you feel you’ve completed a project to the best of your ability. Being productive requires good organization. Sure, things will crop up during the week that you didn’t anticipate. But trying to plan your priorities can really help you tick tasks off the to-do list. On Monday morning, spend 30 minutes scheduling your activities for the working week. Then take an extra 10 minutes every other morning to review and react to incoming issues. Multi-tasking on lots of different jobs at once can kill our productivity. Whilst you sometimes need to dip in and out of different tasks, learn to focus when you need to. This could mean turning your phone to silent, only having relevant web tabs open in your browser or even finding an empty meeting room in which to work for a few hours. So you’re right in the middle of something and your boss lands a new project on your desk. You need to have a reliable way of tracking all of your tasks and where they’re up to. There are plenty of online organizational tools, such as Trello, that can help you stay on top of your workload. Alternatively, a color-coded Excel spreadsheet or an old-fashioned (but well-organized) paper notepad could be just what you need. There are lots of ways to automate the marketing process. Whilst you can’t completely rely on software to do your job for you, having the right tech tools at your disposal can save you lots of time during your working day. Sometimes there’s a learning curve involved. But once you’ve mastered a new marketing software, you’ll have a few extra hours in the day to play with. Start your day by dealing with the big, looming tasks that you don’t like to think about. Having them hanging over you all day will hinder your productivity. Contrarily, knowing that you’ve attacked and conquered those challenging jobs will give you a boost of motivation that will see you race through the rest of your tasks. When you’re busy and working to deadlines, it’s easy to let your eating habits slide. Fast food becomes the norm and you rarely get your five-a-day. But eating right can really help your productivity. It will sustain your energy levels throughout the day and help you to avoid that post-lunch slump where you can’t seem to get anything done. Eat a nutritious breakfast and lunch. And opt for healthy snacks that won’t make your blood sugar rise and then crash, leaving you feeling tired and lazy. Sometimes it’s hard to switch off from work. Everyone else seems to stay late at the office. Our smartphones ping all evening long with work emails. But it’s actually counter-productive. Our brains need to take a break from work if we’re to return in the morning refreshed and raring to go. Make the most of your downtime and see quality relaxation as essential to your work performance. Take care of yourself and reassess your working style to boost your productivity at work. Just a few little changes could see your output increase and greatly improve your sense of work satisfaction too. Guest Author: “Rachel Jackson” – She is a mother of 2 beautiful boys. She loves to hike and write about traveling, education, and business. She is a Senior Content Manager at Bizset.com – an online resource for relevant business information.